At the last moment of one day (11:59 pm) my wife and I each exhaled our last breaths of that day into a single balloon. The next day in the hot-shop the breath was transferred from the balloon through a blowpipe directly into molten glass to produce the bubble, or vitrified breath. The bubble is attached to a custom stem with a shut-off valve and the balloon. 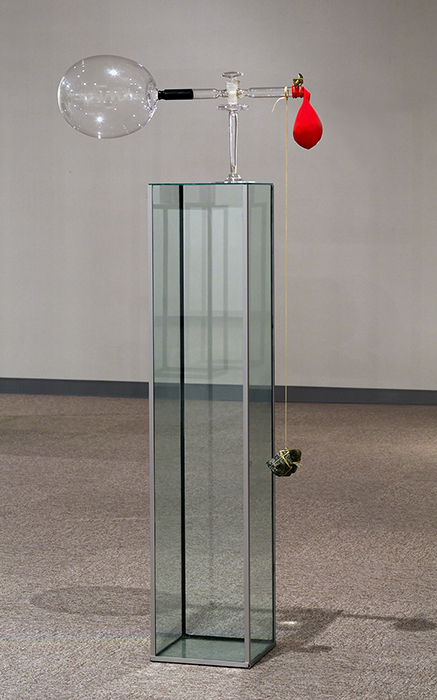 Two rocks dangle from the piece as physical proxies for the metaphorical weight of the breaths expelled, and balance the piece delicately; without them the sculpture would tip over.